A major component of President Obama’s Thursday address on his administration’s counterterrorism policy was the use of drone strikes against suspected terrorists, a program that had raised questions from lawmakers of both parties on Capitol Hill about its secrecy and legality, and had drawn almost universal opposition abroad. Obama acknowledged the “profound questions — about who is targeted, and why; about civilian casualties, and the risk of creating new enemies; about the legality of such strikes under U.S. and international law; about accountability and morality.” He defended the program as “necessary,” “legal” and one that was “effective” in degrading terrorist organizations like al Qaeda, but he also said it was time to scale back its use. 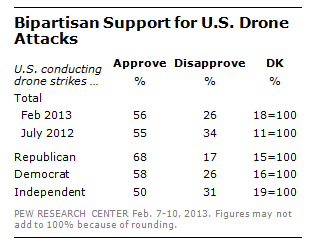 The U.S. public has consistently supported the use of drone strikes — and that support has been bipartisan. In a February survey, 56% of Americans approved of them while 26% disapproved. That included 68% of Republicans, 58% of Democrats and 50% of independents. A significant number of Americans did have concerns about whether the strikes endangered civilian lives. More than half (53%) were “very” concerned. But the survey found less concern about the legal issues that dominated the debate in Congress, particularly over the targeted killing in Yemen of radical Muslim Cleric Anwar al-Alwaki who was a U.S. citizen. A day prior to Obama’s speech, the administration acknowledged for the first time, in a letter to Congress, that it had ordered that drone strike, and said past strikes had killed three other Americans. On the legality issue, about three-in-ten (31%) of Americans said in the February survey that they were very concerned about whether the drone program was conducted legally. A Gallup poll, conducted in March found, that while 65% of Americans supported the use of drone strikes to kill suspected terrorists in other countries, 52% opposed such strikes if the targets were U.S. citizens, 66% opposed drone strikes within the U.S. against suspected terrorists, and 79% said drone strikes should not be used within the U.S. against American citizens suspected of being terrorists. The Gallup poll was conducted after some of those concerns were raised during a 13-hour filibuster on March 6 by Kentucky Sen. Rand Paul aimed at blocking the nomination of John Brennan, an architect of the administration drone program, to be head of the CIA. Lawmakers had also raised concerns about the backlash abroad over the increased use of drones during Obama’s administration in countries like Pakistan and Yemen. A March survey in Pakistan by the Pew Research Center found that only 5% of Pakistanis approved of U.S. drone strikes targeting extremists, while 68% disapproved. A somewhat higher number (21%) approve of the use of drones strikes if they are carried out in conjunction with the Pakistani government, while 38% still opposed them, and 41% offered no opinion. 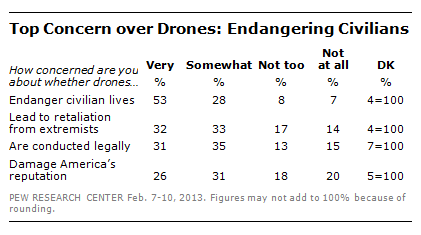 About three-quarters (74%) of Pakistanis said the drone strikes killed too many innocent people. A 2012 survey of 19 countries plus the U.S. found that, in 17 of them, more than half disapproved of the U.S. conducting drone strikes to target extremists. The policy was particularly unpopular in majority Muslim nations, but it also faced disapproval in Europe and other regions as well. The strongest disapproval was registered in Greece (90%), Egypt (89%), Jordan (85%), Turkey (81%), Spain (76%), Brazil (76%) and Japan (75%). There was a significant ideological gap in Europe on the issue. A majority (56%) on the political right in Britain favored the use of the drone strikes, but just 31% on the left did so. Similarly, in France, 49% of those on the right approved of the strikes compared to 26% on the left. There were also double-digit differences in Italy, the Czech Republican and Germany.